The Nature Preserve I've been visiting is starting to show it's colors. 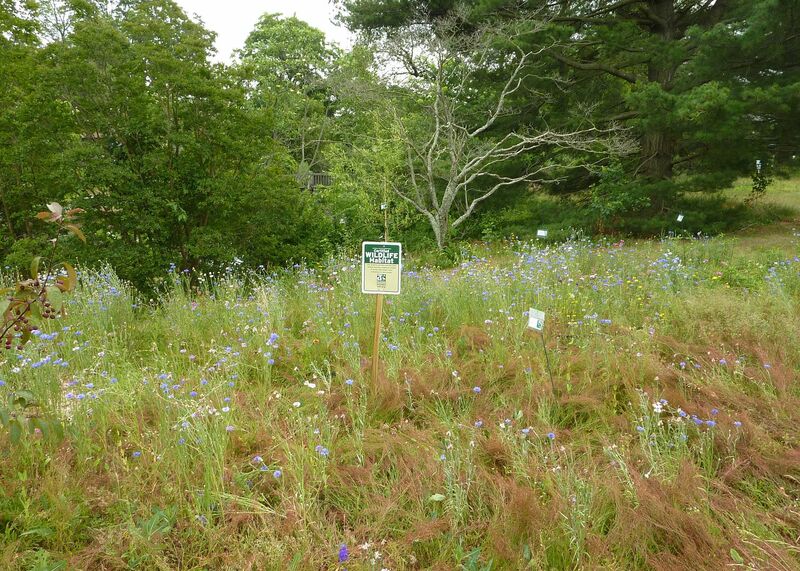 Sure it lacks any and almost all forbs, mainly herbaceous perennial wildflowers, but the wealth of trees are still supporting a fair amount of life. 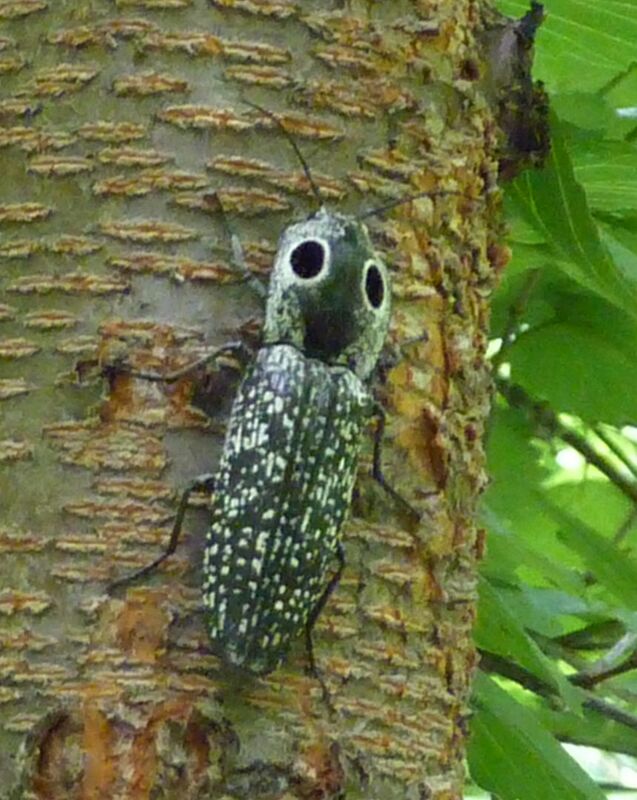 This is an Eyed Click Beetle. It's almost two inches long and the larval stage is a predator of other beetle grubs. Click Bugs are neat because they actually click. The abdomen and thorax flex in such a way to propel the bug several inches into the air. This is handy when they fall on their own back. This particular beetle also has wings which make it look very menacing when it's flying at you. This is likely in the genus Calopteron species of some sort. Kind of pretty but not that huge compared to the other beetles so far. 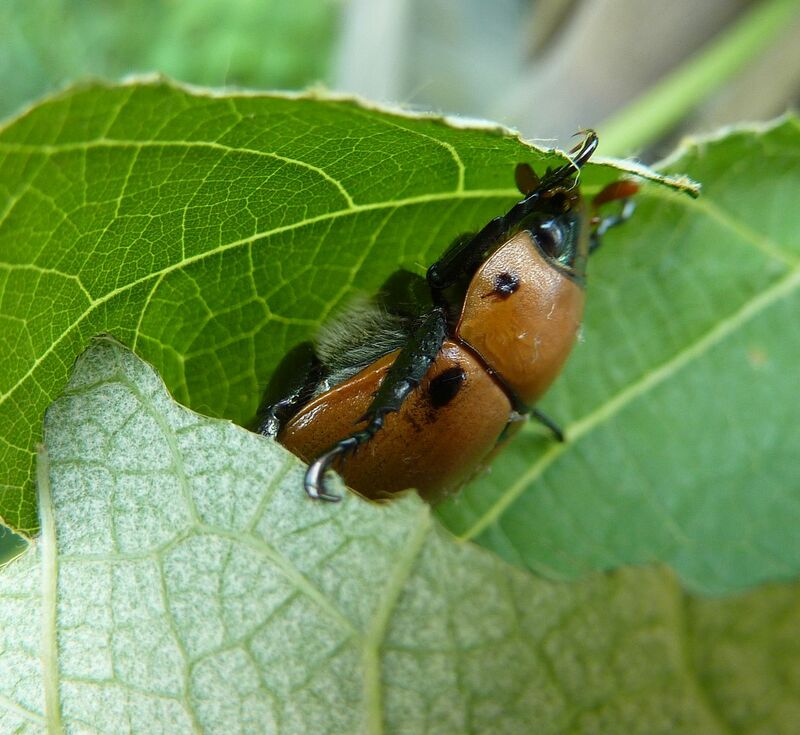 Adults feed on nectar and tree sap, while the grubs are supposidly predatory but sources are unclear. I think it's neat how it's almost mimicking a moth of some sort. 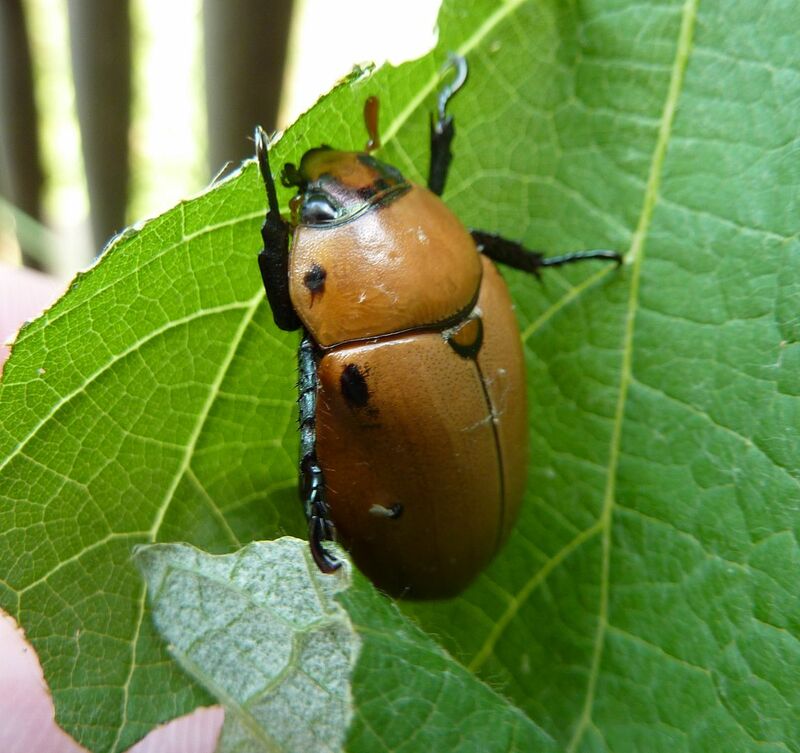 Grapevine Beetle. This was actually in my yard eating our grapevine. But the forest I was at is only 10 minutes down the road and had plenty of wild grapes growing about. I'm unsure what the hairs under the abdomen do but this sucker ate half of one leaf in just an afternoon. It's vanished since then but that's an impressive amount of foliage to eat. The adults specialize on grapevines, but the grubs I read are general towards roots and rotting wood. In a sea of under story plants we go back to the one that captured my eye the most. 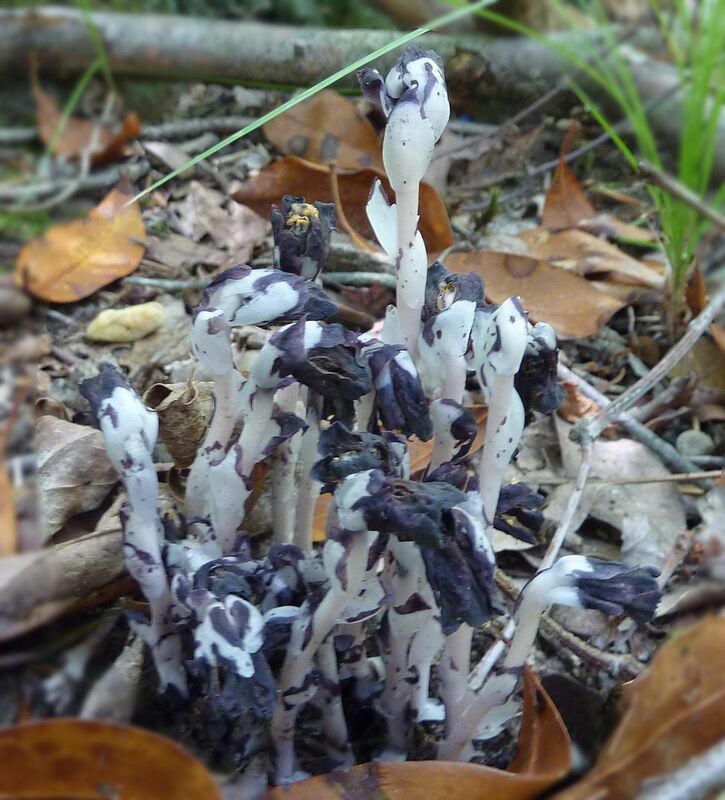 Indian Pipe could just as easily be renamed Hydra's Head or something that effect. Though I can see the resemblance to a pipe when it's up right and blooming at it's prime. As it falls over and slowly melts away the stem bends and adds a curve like a dragon's neck. The multiple heads of the Hydra coming out of the sea. The Hydra in Greek Mythology is a serpent who grows two heads where one once stood. It's represents the problem that only gets worse by trying to fix it. So this is a hydra in name only. Indian Pipe is by no means a problem. 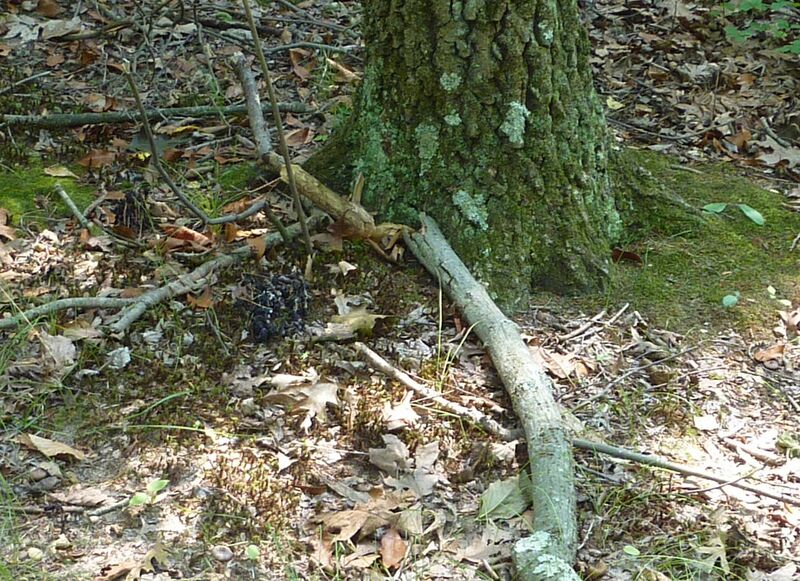 Going back to the first picture to this post the Indian Pipes were all leaching off a massive Swamp Oak tree at least 40' tall and at the peak of his health. Ripping off a head will not make new ones grow back but the problem does grow more heads as time goes by. Once again I visited the boring nature site known as Crows Woods. Sure it takes hours to walk, there's almost nothing growing in the under story, and there are all of 5 signs to reads, (one about swam gas... oh joy,) but I'm starting to the place. Their lack of sign-age is a major issue though. If I wasn't skilled enough to identify insects and flowers I'd still be rating this nature preserve as the most boring in the country. But over the past week some interesting things have popped up. 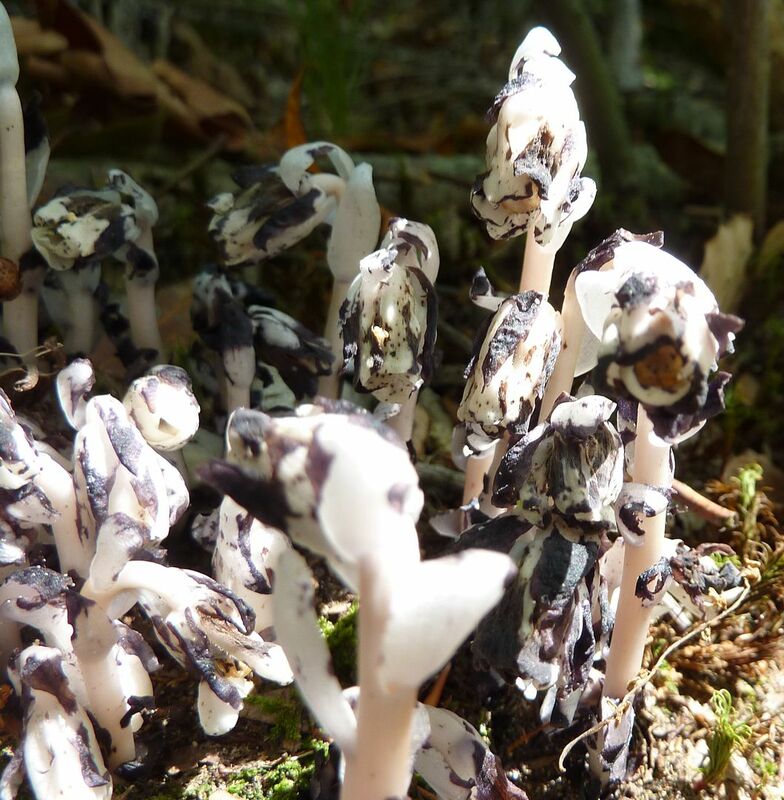 Indian Pipe, Monotropa uniflora, is parasitic plant that emerges for only a few weeks over the summer. It's actually an "epiparasite" which is basically a symbiotic relationship between two parasites. 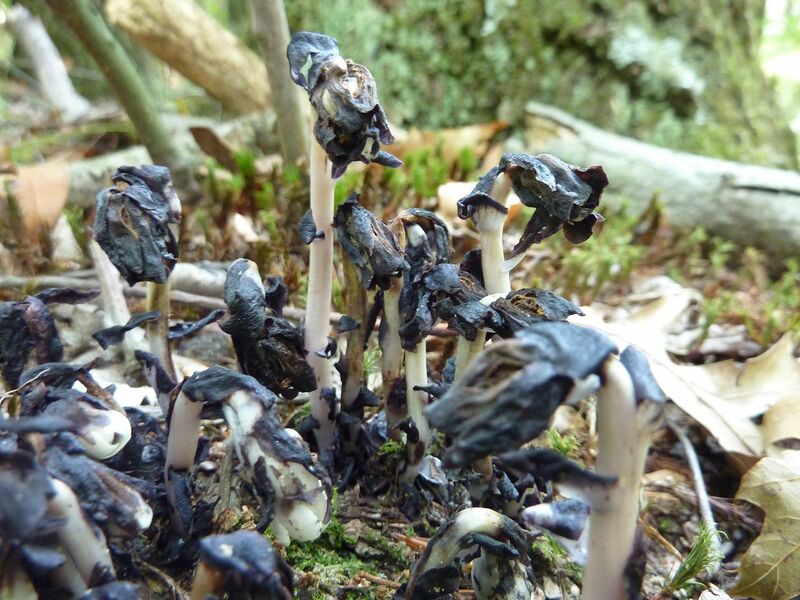 Indian Pipe doesn't steal food directly from it's host tree, but rather produces nutrients that promote the growth of a certain kind of fungus that exchanges food with it. This makes transplanting all but imposable. The plants I found were a bit past their prime. Normally they're an albino-ish cream color. They don't have chlorophyll or chloroplast so the flesh lacks the green or even brown color seen in other plants. 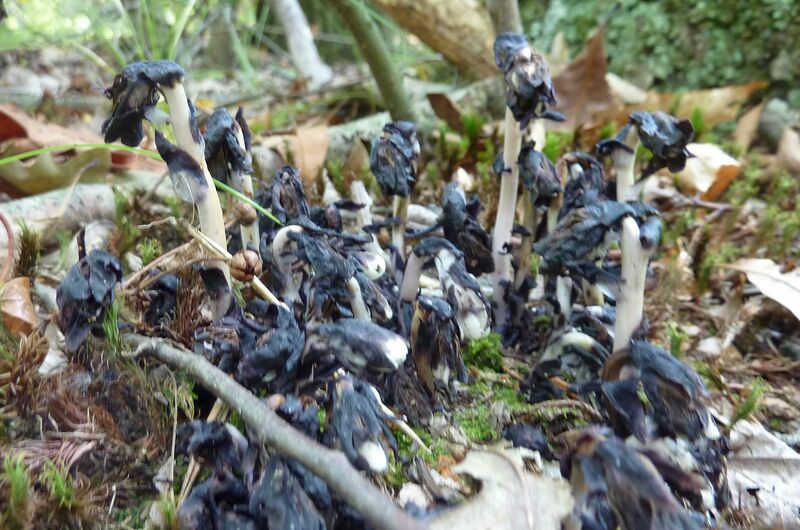 Shortly after blooming seeds are quickly produced and the plant turns to a gooey black as they melt away. I'm tempted to go back and collect seed if I can. And probably a soil sample to hopefully start a patch in my garden. They always grow in full shade, though this one was getting some afternoon sun. 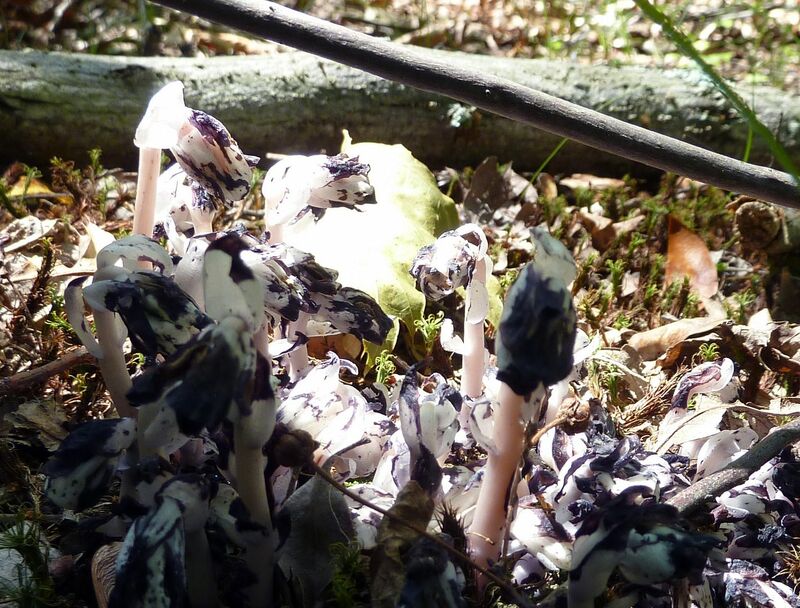 To read more about Indian Pipe and other wildflowers I recommend reading The Secrets of Wildflowers: A Delightful Feast of Little-Known Facts, Folklore, and History . Though it's a little whimsical I'm growing to appreciate it. 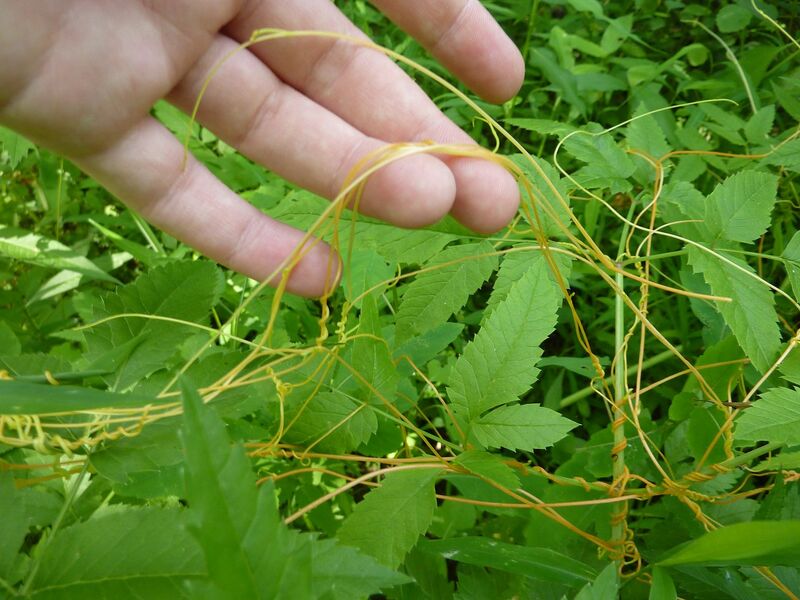 This yellow string like plant is a Cuscuta species. 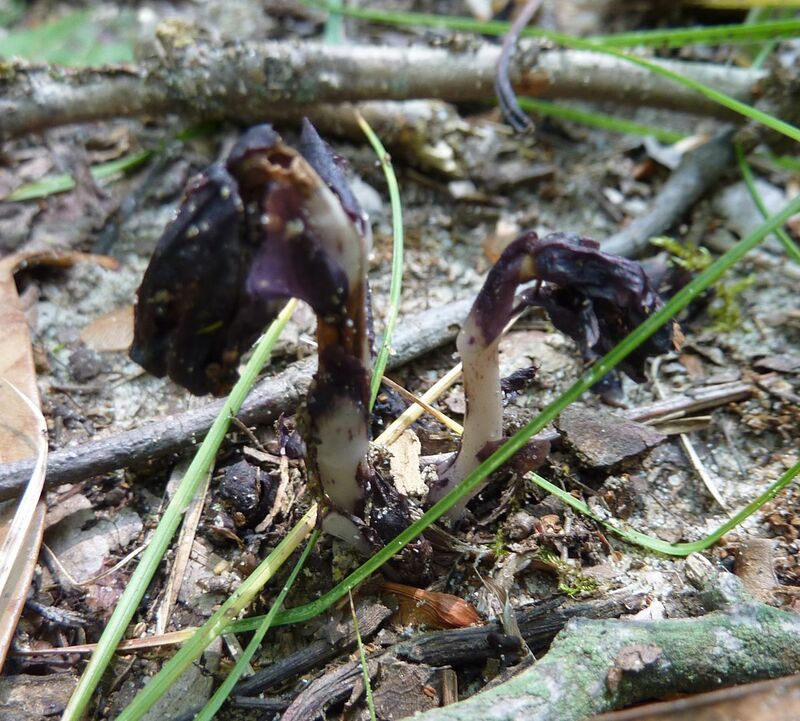 It's a simple parasitic plant that grows as a series of tendrils. 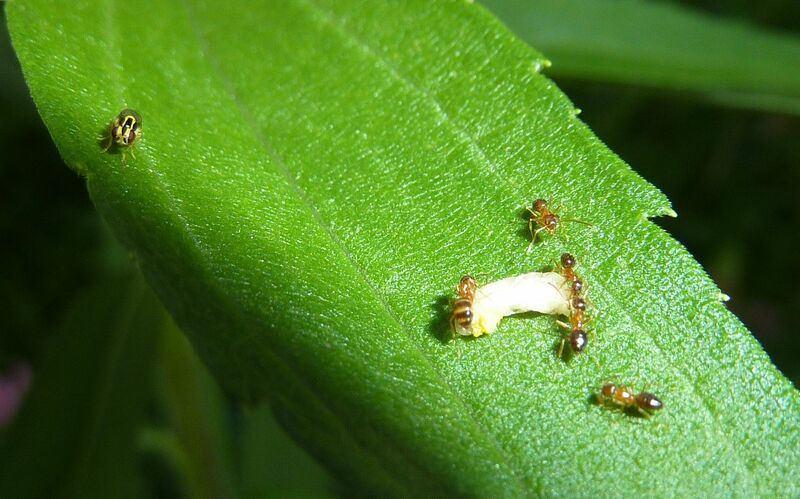 They wrap around the host and sap it of energy. I honestly had no idea what it was when I found it. This is a neat group of plants. Wikipedia offers more information. 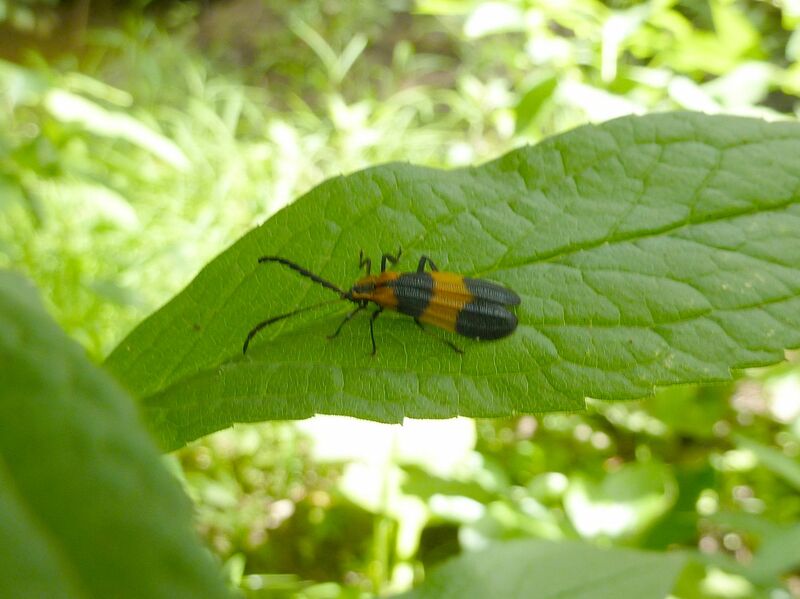 So thanks to the folks at the Wildlife Gardeners forum for you help identifying. 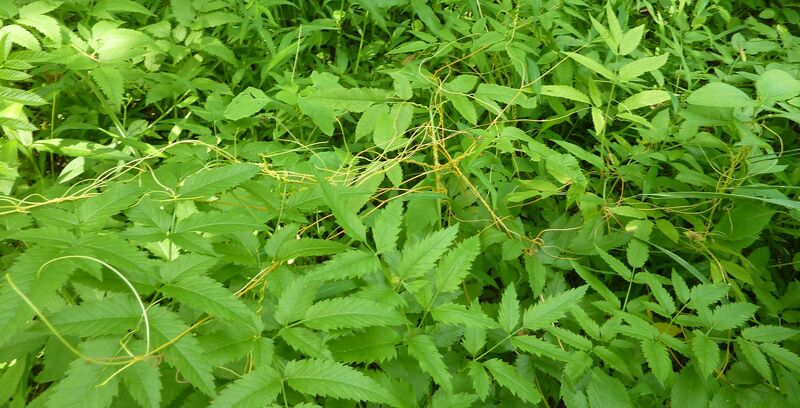 A forest that can support populations of parasitic plants is a true sign of health. Sure they are parasites but such things rarely kill their hosts. They should be admired for taking advantage of a certain click in their ecosystem. The added diversity should be treasured. 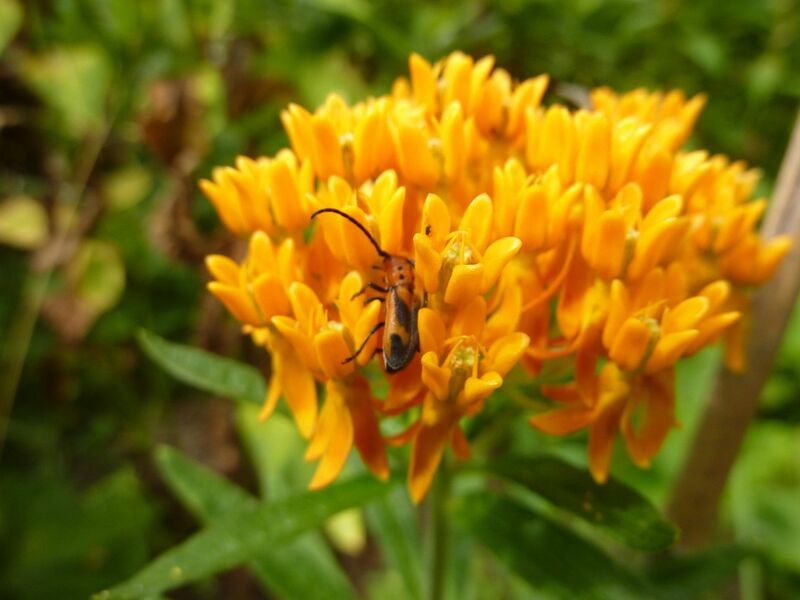 This is the yellow form of Asclepias tuberosa, aka Butterfly Weed. It's taken a few days but the communicative effect of bees flying to love this plant has taken off. Two days ago there was just one bee on it at almost all hours of day light. The next day had 2, then later that night had 3. And now it's full out buzzing with bees, upwards a dozen or so from dawn to dusk. And this will keep up for the week or two that this plant is at full bloom. 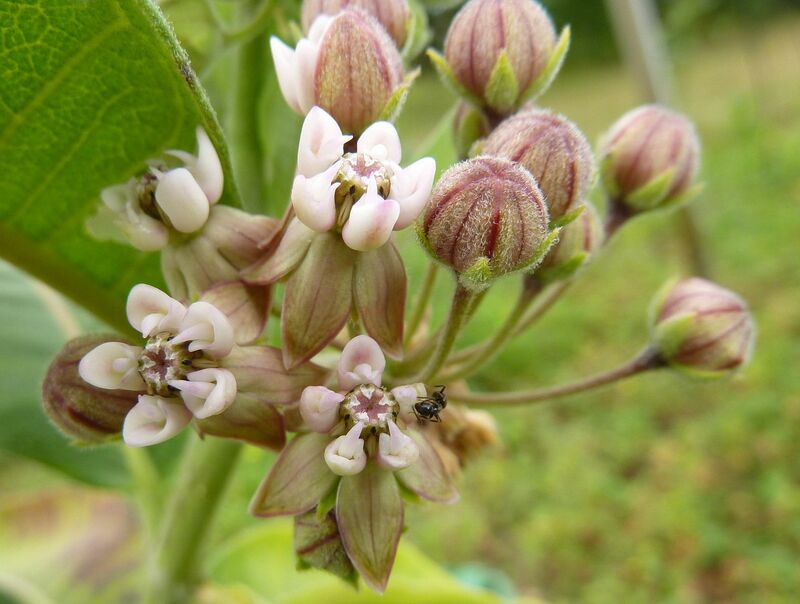 Milkweeds double as host plants for Monarch butterflies throughout their range. 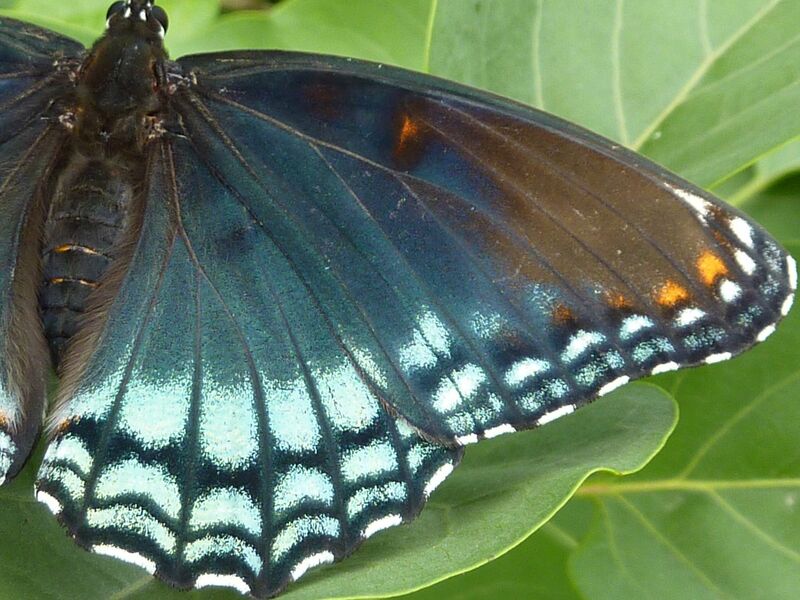 There are also about 11 other Lepidoptera that use it as a host plant. 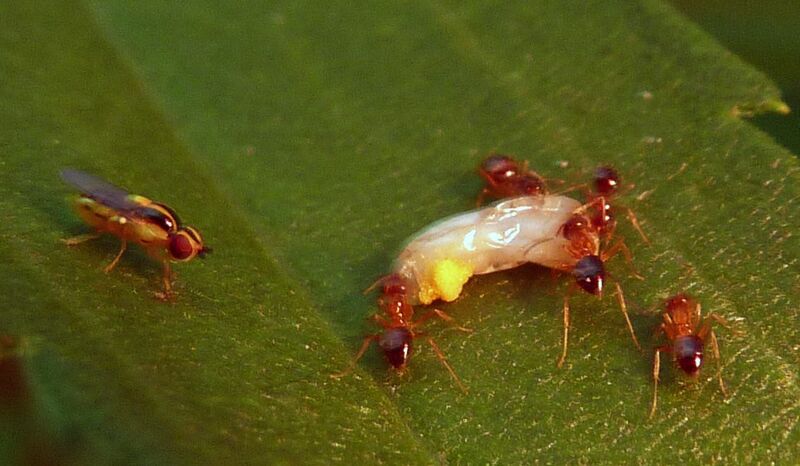 Nylanderia flavipes is a commonly imported species of ant. They're reaking havoc with my raspberry patch and that's bad. But away from the raspberries they find other things to nibble at and so the flies. I'm not sure what the fly in question is here but I thought it was cute how it would sneak up gingerly to the food item and steal a bite now and then. I hope this demonstrates why I hate public feeding. This is a hummingbird feeder that lacks guards on the tube openings. The reasonably short tongue of the honey bee (compared to a hummingbird) can easily reach in and take the nectar/sugar water. 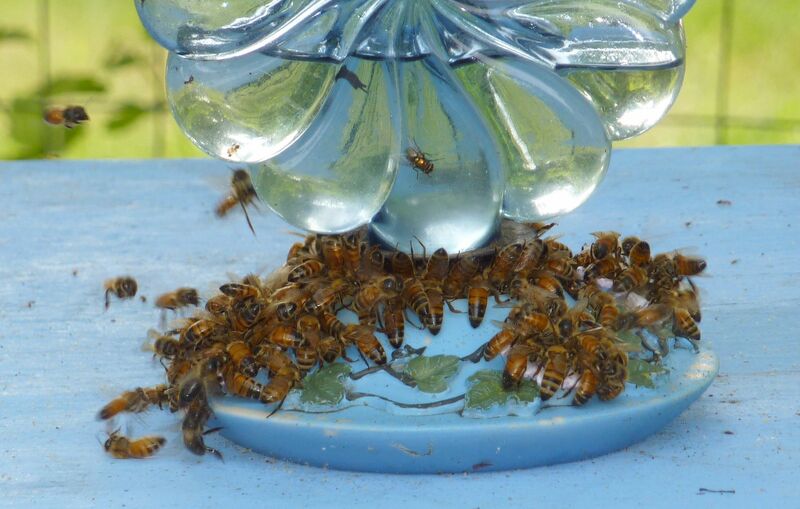 I'm all for feeding bees and providing nectar sources but public feeding isn't the answer. There are bees tumbling over one another, and fighting to get at the nectar. I witnessed some actually stinging their fellow bees to death. As fall draws near, assorted wasps and hornets who are more suited to aggression show up to the dog pile. 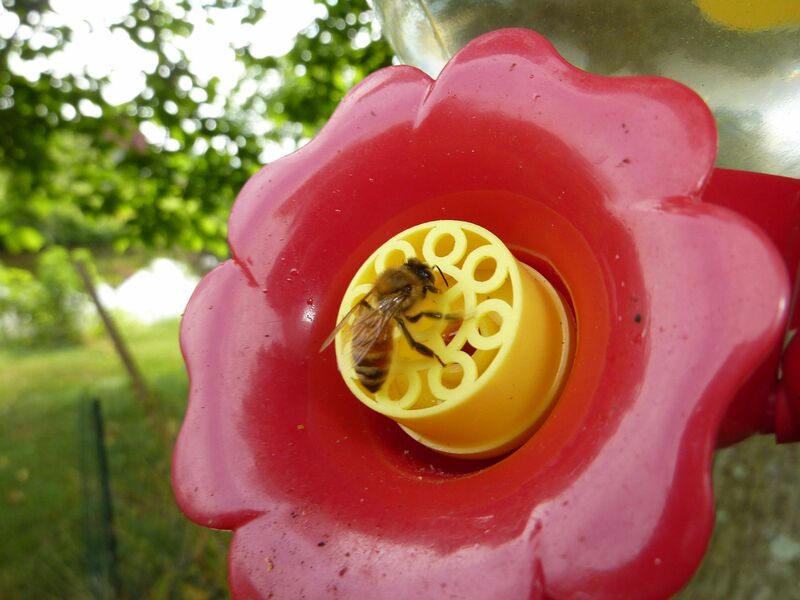 They make special feeders that attach right onto the honey bee hive so this public feeding isn't necessary. Hummingbird feeders with guards on them still get some attention but it isn't the open buffet as seen above. Your hummingbirds will thank you too. Well a rose I planted decided to bloom a little young. Not even established yet and it's already sending out flowers. 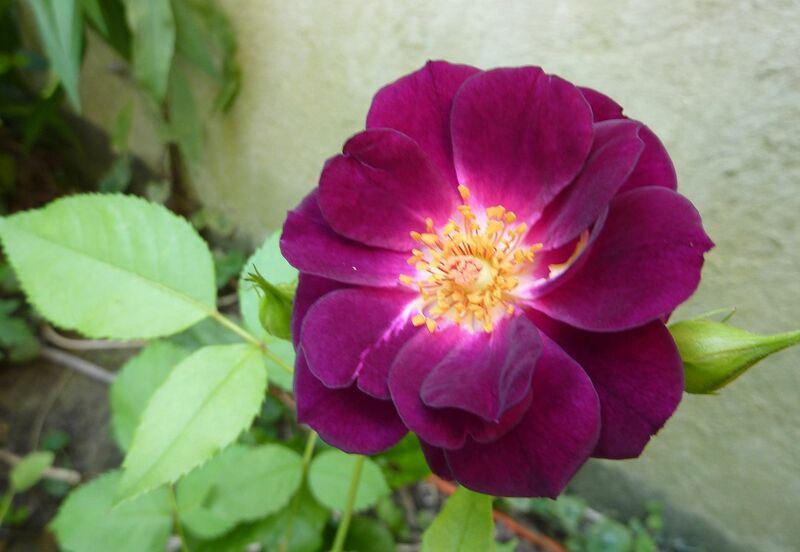 This is the Midnight Blue Rose that I planted earlier this year, to compliment one called Agatha Christie, so named after the author. Agatha isn't blooming yet but I'll let you know when she does. I'm so impressed with the color. More so by the radiant pink that burns out from the middle. The purple is nice and dark too. This rose turns into a smallish sized shrub and with brilliant blooms like this I'll have to rearrange what's growing around it. 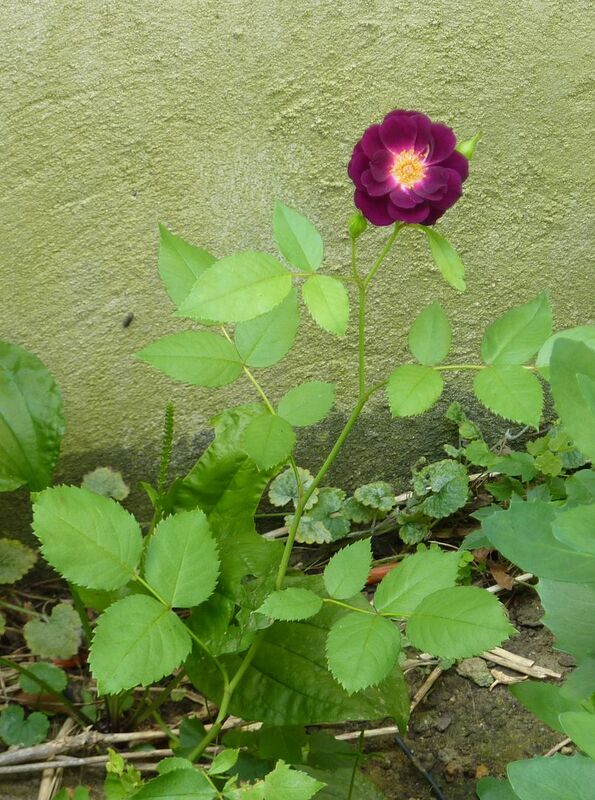 Rosa carolina, for it's brilliant pink color but apparently it spreads aggressively. 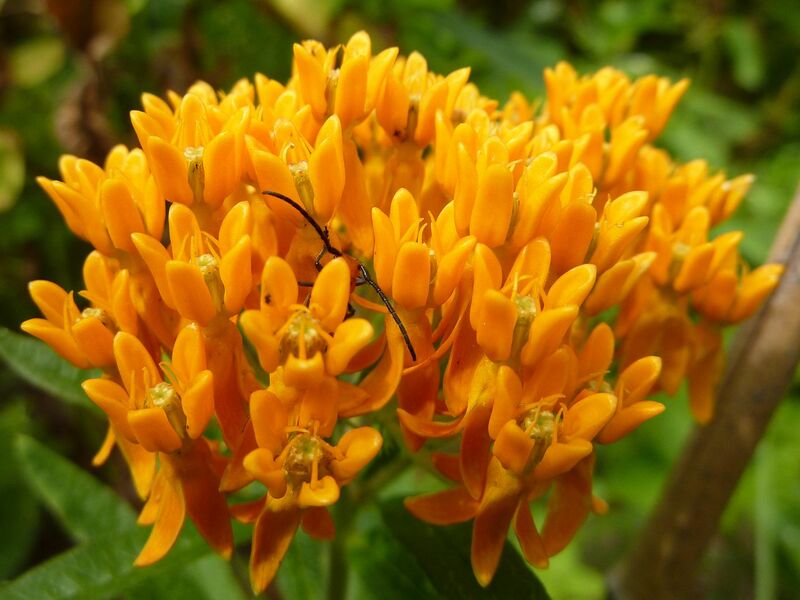 Asclepias tuberosa, for it's brilliant orange color. Generally anything that goes with purple. Be warned with anything yellow though. Colors that are opposite one another on the color wheel will trick the eye into thinking they're vibrating. Perhaps that's another reason why the middle of the flower looks so intense. 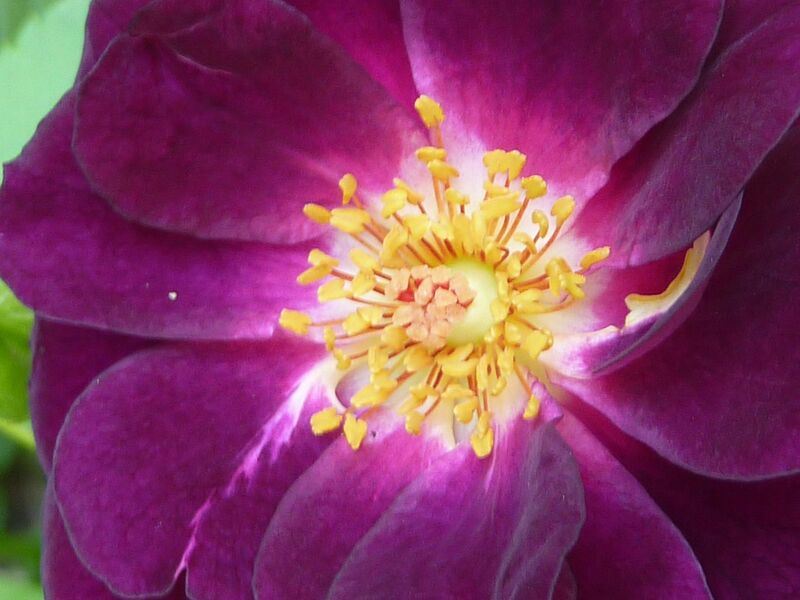 A larger bloom might lose the effect the center of the flower creates. It's fragrant too. It smells, to me, like hand lotion. Very much like Oil of Olay. It's not as strong as I'd thought it'd be but for only one flower I'm still impressed. I can't wait for this to take off into a full shrub. Yay! My buttonbush has a caterpillar one it! I don't know what killed it but yay it had one on there! 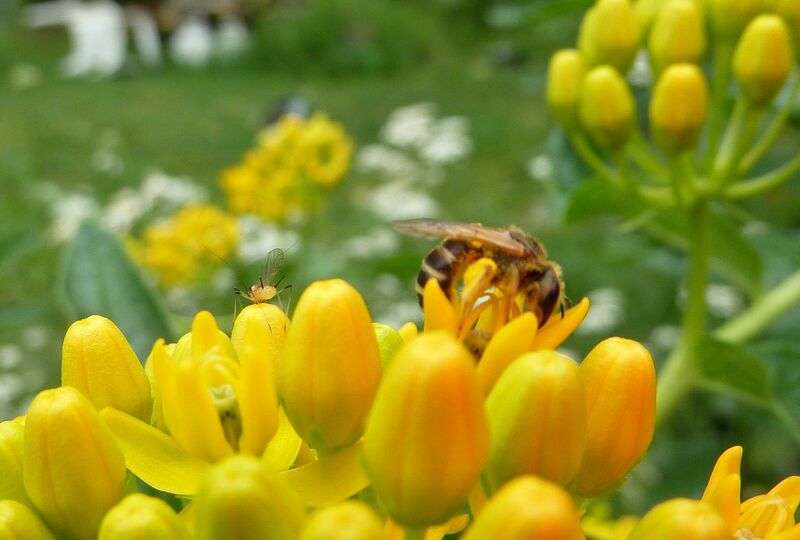 So I'm finally at that time of year when the honey bees notice I have a garden. Honeybees are great at what they do but sometimes I wish they were more A.D.D. about it. Bumblebees have that, and they just go through the whole garden saying "Hay look a flower! Hay look a flower! .... Hay look a flower!" over and over and over again. It's a more even pollination because they're working them as they go. 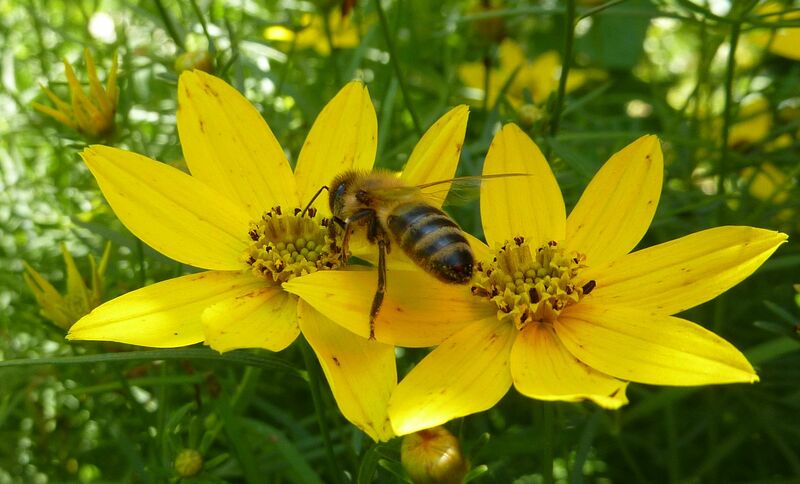 Honeybees have a habit of playing favorites which is okay but limits their ability to find new blooms. 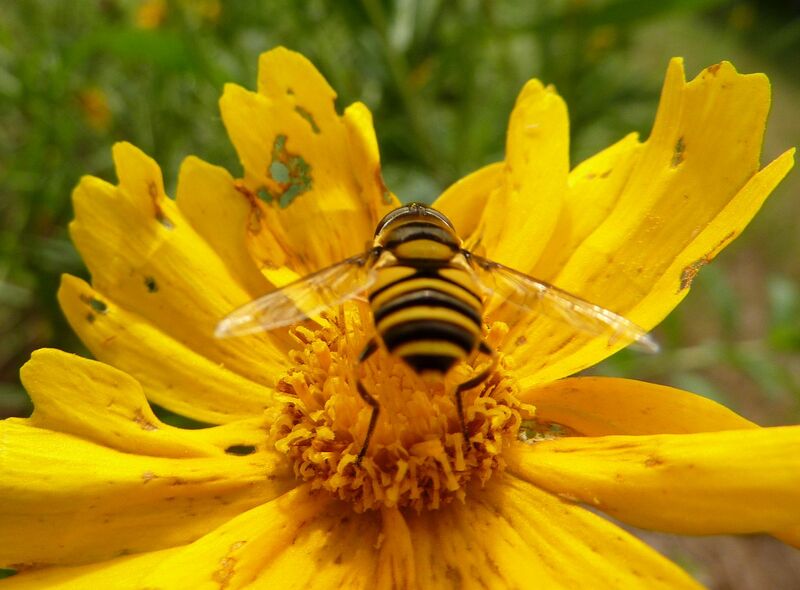 Often times it seems the younger foragers, in an effort to mimic the older bees, will copy bumblebees in their A.D.D. quest for nectar. 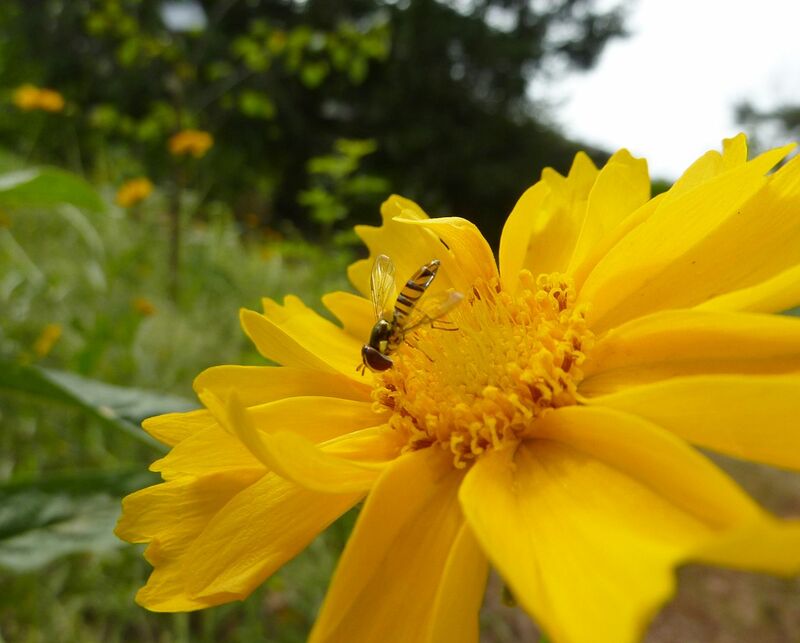 This leads to all sorts of new and exciting nectar sources, like Coreopsis. As you can see this has been blooming for a while now but nothing has really been working it. I finally saw my first honey bee on it earlier today. She spent quite a while on the plant working each bloom then left. A few return trips were likely made as the day went on. 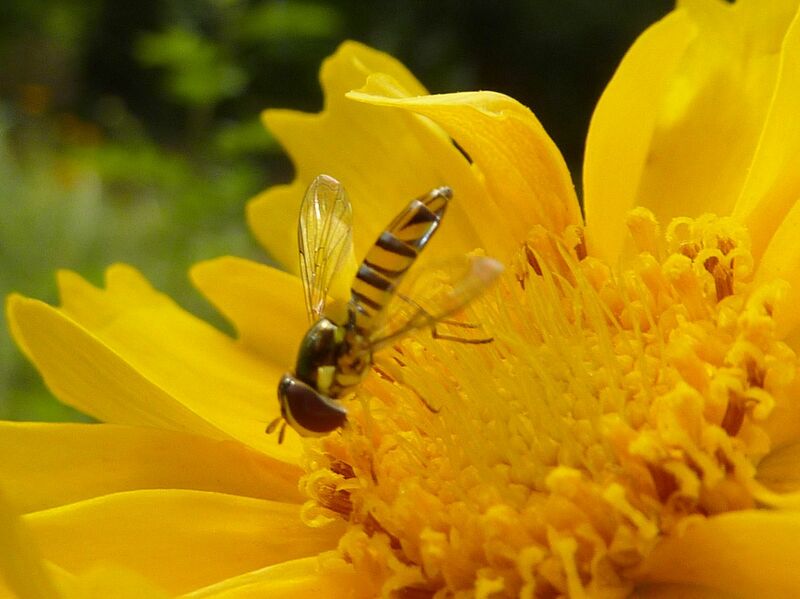 It's said that one honey bee will produce one and a half tablespoons of honey in her lifetime. If I can make that journey to and from the hive quicker then I can get that bee for all she's worth. While we're on the topic let's crunch some numbers real fast. A good honey bee queen is laying between 1,500 and 2,000 eggs a day. That's potentially 2,000 workers that will bring in 2,000 1.5 tablespoons of honey a day. Assuming they're bringing in food for 275 days out of the year that's 550,000 bees/tablespoon and a halves of honey. This doesn't really add up though. I don't know what that adds up to in pounds of honey but the other saying is a good hive on a good year will bring in 100lbs of honey. I don't think either estimate is accurate though. This is just a drawn out way saying pollinator friendly gardens make more honey. Enough has started blooming now (finally) that I'm going to start seeing honey bees more often in the garden, without the aid of a ladder. Yesterday's post was complaining about the lack of successive blooming... well now everything is going to bloom together it seems. A few Stoke's Asters have started blooming, Stokesia laevis. This isn't a true aster but used to be in the Aster genus I believe. 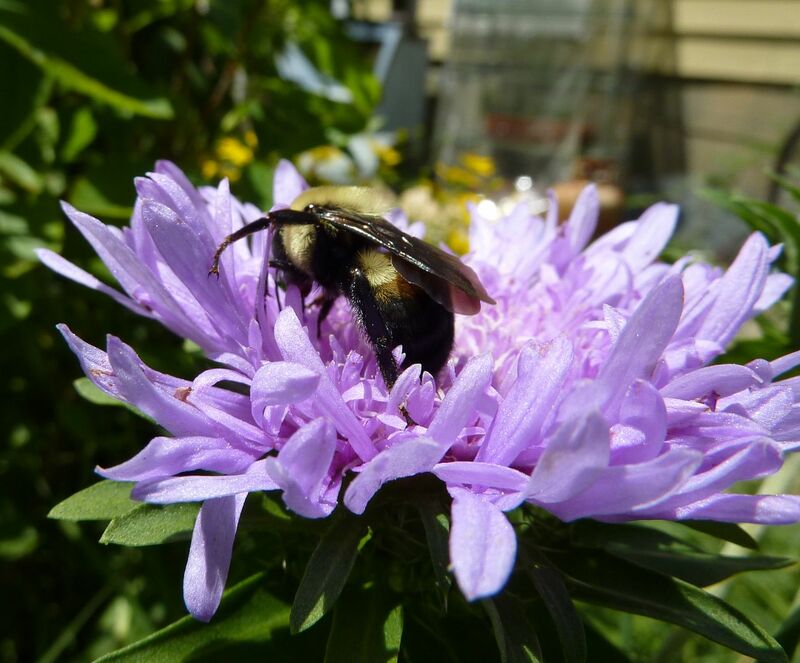 The bees sure work it as though it were an aster though. 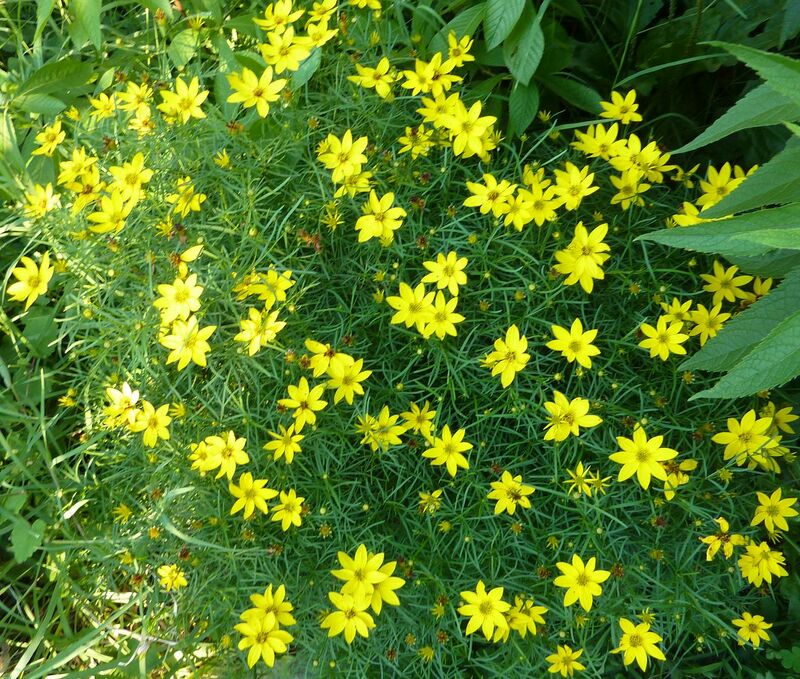 It's a pretty plant too, but benefits from an acidic soil. I saw a few honey bees working it today as well. The earliest crème de la crème has also started blooming. 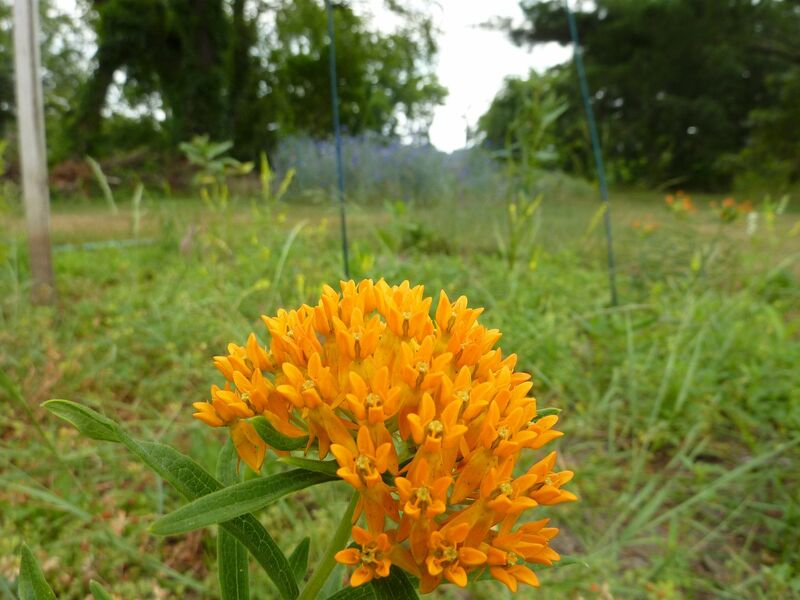 You can have your lawn of clover, your prairie of wildflower, but give me one Asclepias tuberosa, Butterfly Weed and I'll be set. This is a yellow form; They are normally a brilliant orange. Besides a few houseflies this was the only honey bee on the plant. But give it a few days and I guarantee this will be covered in honey bees. 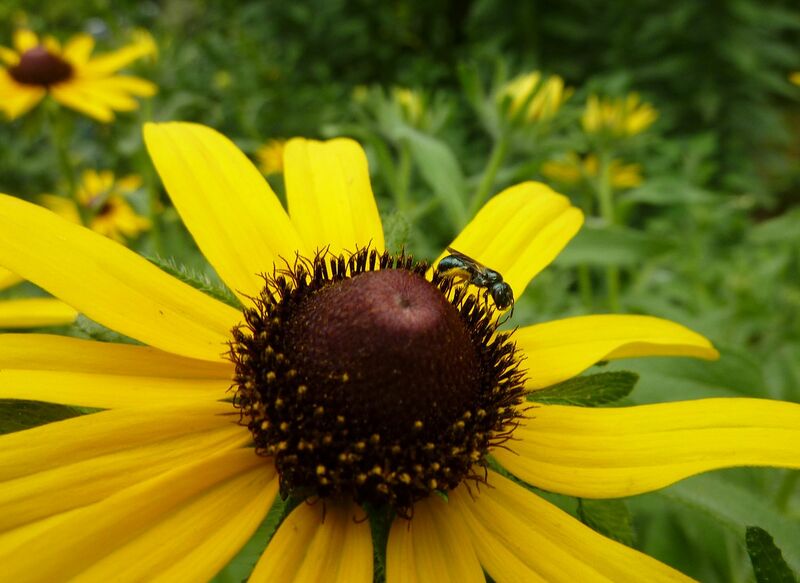 I hope to have a video up for Pollinator Week. About a month earlier I should have been seeing the related Swamp Milkweed, Asclepias incarnata. It's blooming now but not as well as it should be. Many of the flower heads formed then died off it. Hopefully it will fair better next year. 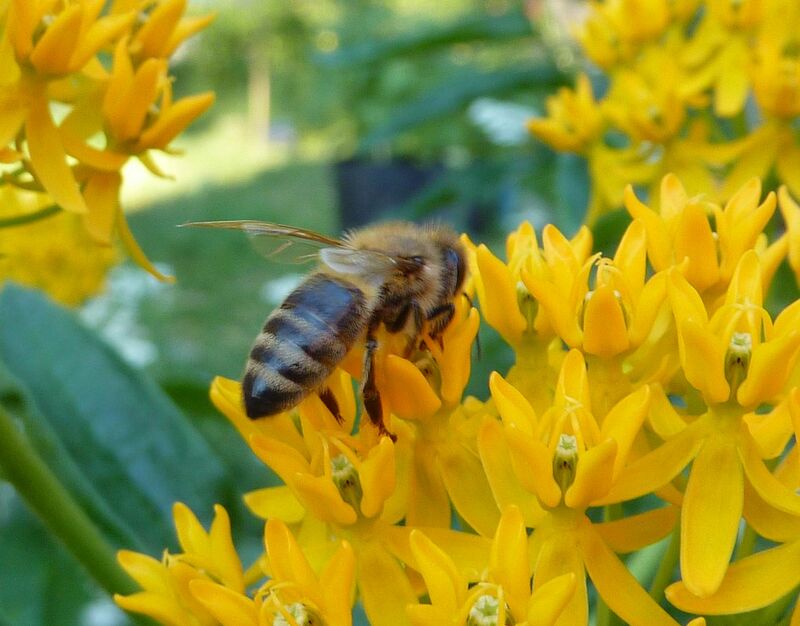 Beekeepers don't like planting milkweeds because they claim it can kill the bees. There's even a documentary style video on youtube going as far to suggest Milkweed does this on purpose. 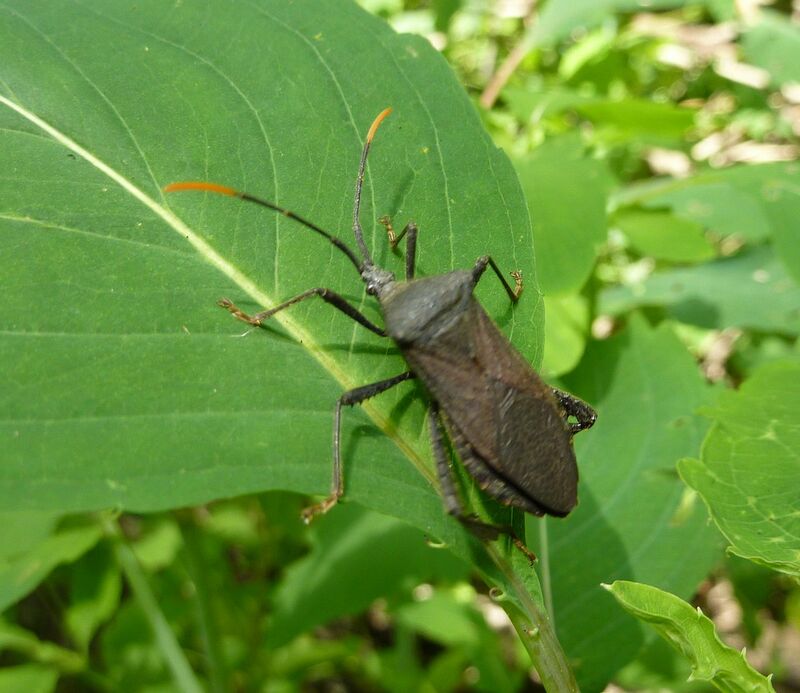 Never mind the fact that assassin bugs can easily take advantage of insects caught on the plant. It's a temporary issue where the bee is stuck, they usually get free with time. But they're still in a bad position that no flying insect likes to be in. 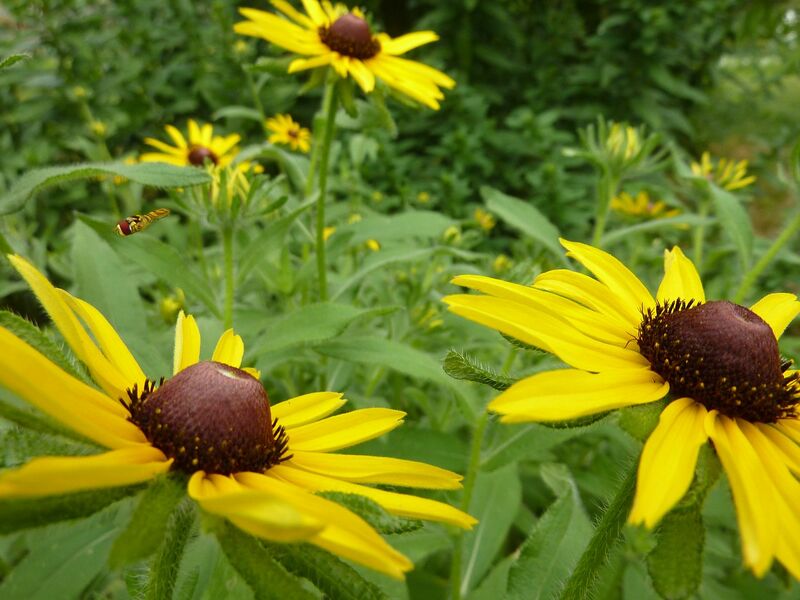 So you may have noticed there is a sudden halt to the Prairie Plants are Blooming Yay theme. I was trying to keep a succession of bloom going but it's actually kind of hard to do this year. We had a harsh winter here with record snow falls, and then the month of May had record highs. This confused a lot of plants. Case and point I have an Aster blooming out in the yard that would otherwise normally bloom in August at the earliest. There are other cases too. Asclepias incarnata, Swamp Milkweed, is finally blooming. It should have had been doing so a few weeks ago but the harsh winter not only killed some of the young plants but the adult plants came back weaker. So their bloom this year is nothing spectacular. Only 1 in 4 plants seem to be unaffected. 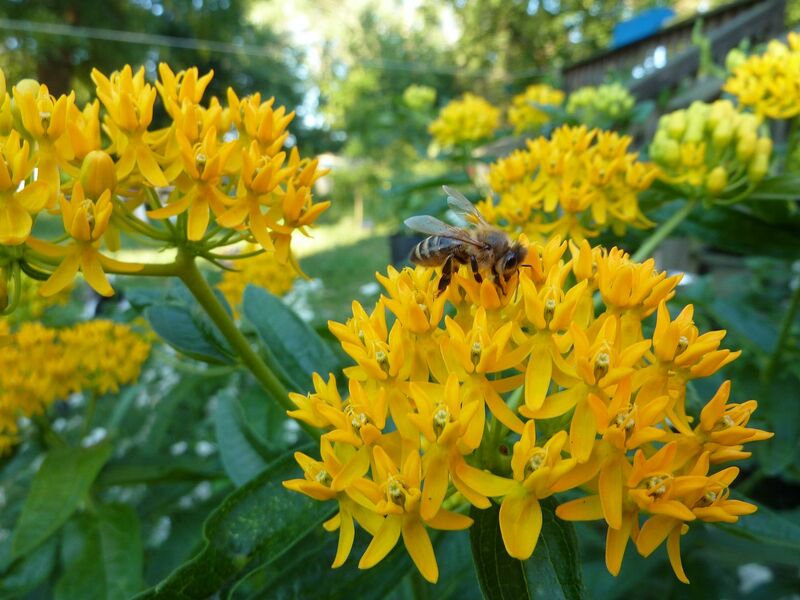 Asclepias tuberosa, Butterfly Weed, (I have a yellow form) is blooming strong though and does seem to be on a normal cycle. So it's good to have diversity even within a genus. My friend has a Magnolia tree, one of the Asian imports that explodes in spring into a huge cloud of blooms. And it's decided to bloom again for some reason. April is normal for this plant but July is unheard of. It's more normal for our native Magnolias, which are typically evergreen and don't have anywhere near as many flowers. The Liatris is finally putting on flower buds. This is kind of normal I suppose for now but they should be taller than what they are. Basically I'm sitting on a ticking time bomb of blooms waiting to explode. The Buttonbush, Cephalanthus occidentalis, is about to bloom right along side the Joe Pye Weed. 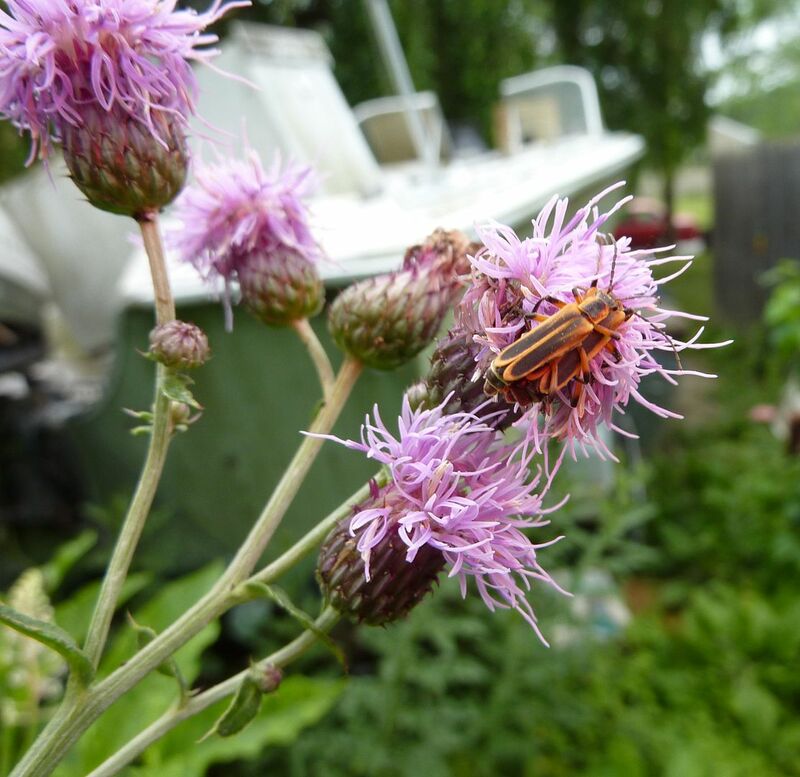 The Liatris will likely bloom during this craziness as well as just about every coneflower in the yard. 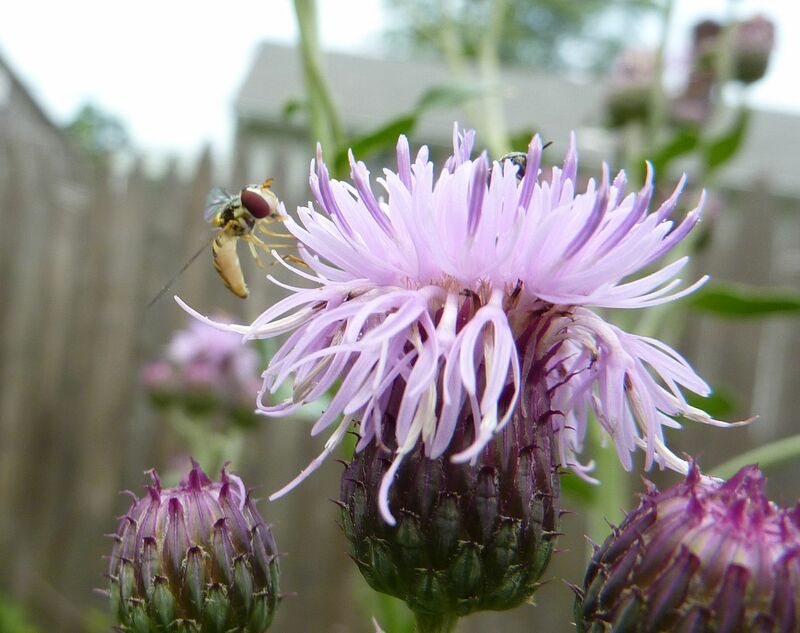 This spring has been such a drought of flowers that I'm tolerating the thistle to bloom. 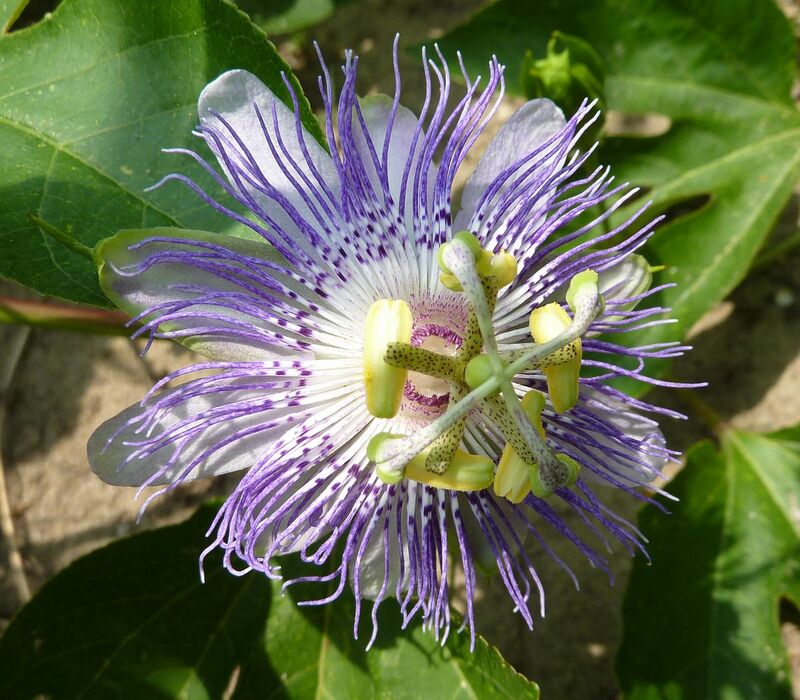 One plant of this flowering can lead to fifty more over the next three years weather you allow the parent plant to flower during the fallowing two years or not. I'd tolerate thistle more if they weren't covered in so many thorns! 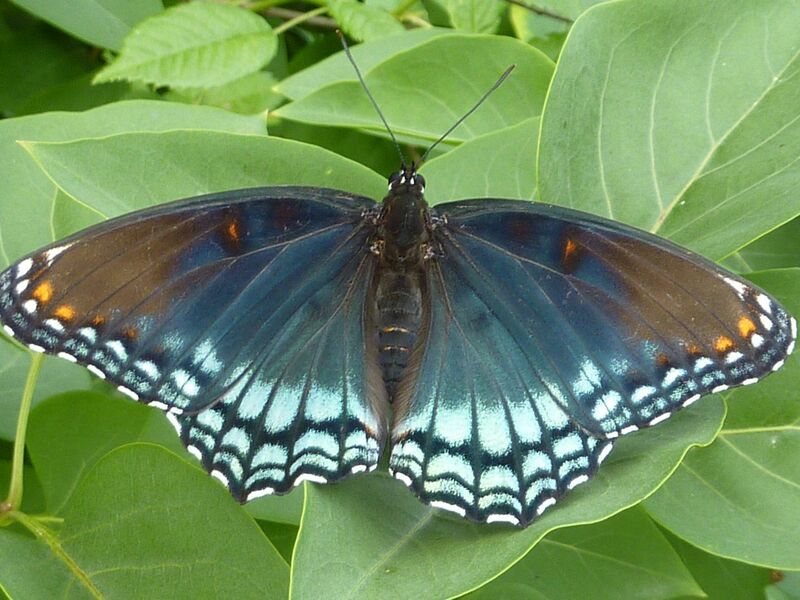 They're otherwise neat plants, butterflies love them, beneficial insects flock to them. If it wasn't for the thorns this would be a plant for everyone's garden. Another reason I'm tolerating the bloom is the patch is right next to my newly planted Persimmon tree. Which has just now (July!) decided to bud out. My understanding is this is normal for new plants, but it's unclear if this applies to adult trees. 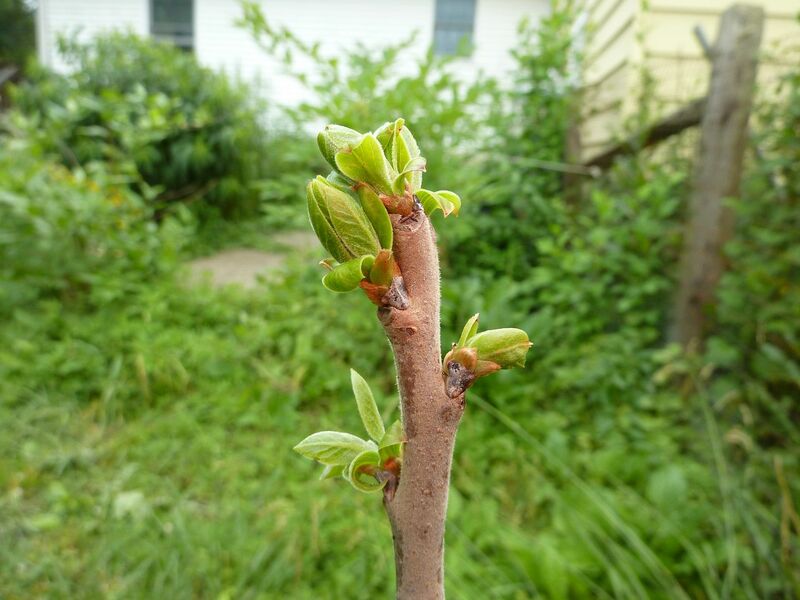 This is a native species, Diospyros virginiana. Normally the ones bought in stores are imported from Asia. If they're not super soft and squishy, they're not ripe. Asian Persimmons are "self pollinating" so you only need one tree. 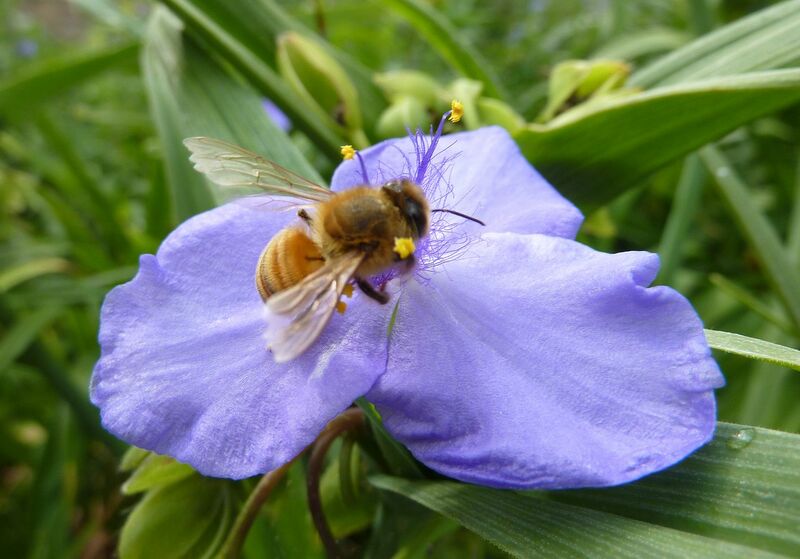 That is to say it doesn't matter if the flowers are pollinated or not, they'll produce fruit almost 100% of the time. Unpollinated Persimmon fruit is naturally seedless. Persimmons native to North America all require pollination from another plant... and I want to say it's male and female trees! Not just two of the same species, gender matters. However, I've bought a cultivar named "Meader" which is said to be 70% self pollinating. 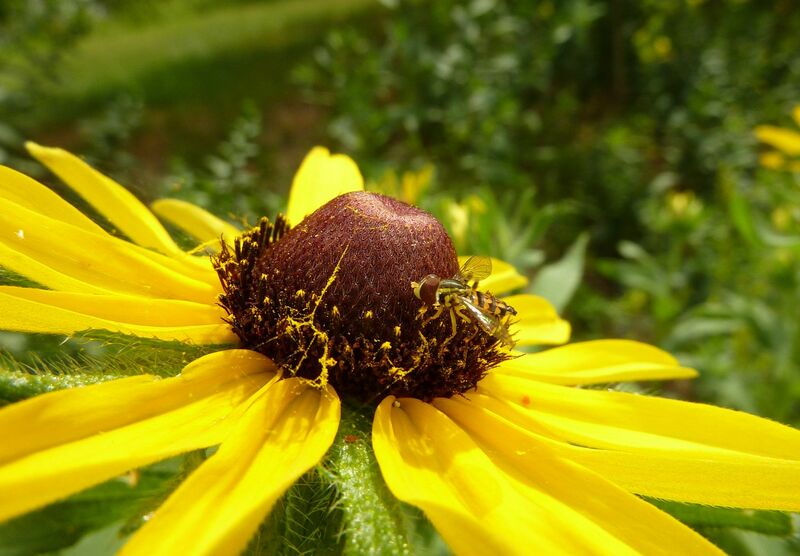 What 70% applies to has yet to be seen, rate of self pollination? individual trees? 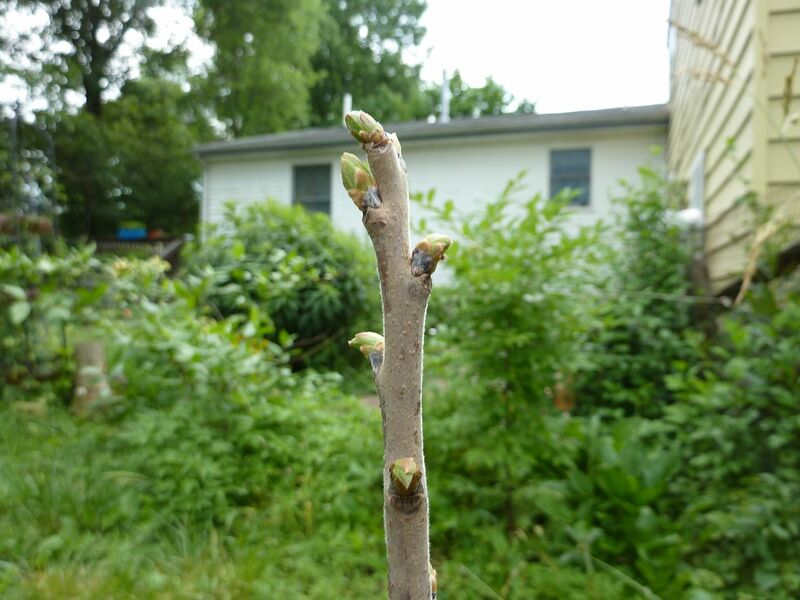 but should fruiting fail it will give me the chance to try buy another native persimmon and attempt grafting. We're getting ahead of ourselves though, but it never hurts to have wishful thinking. 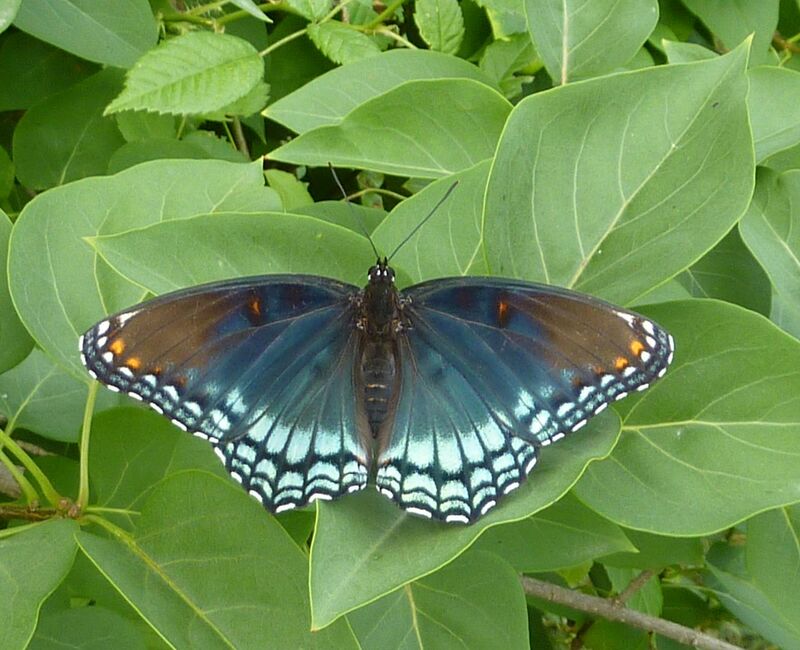 Buttonbush is another of my favorites for the butterfly garden. 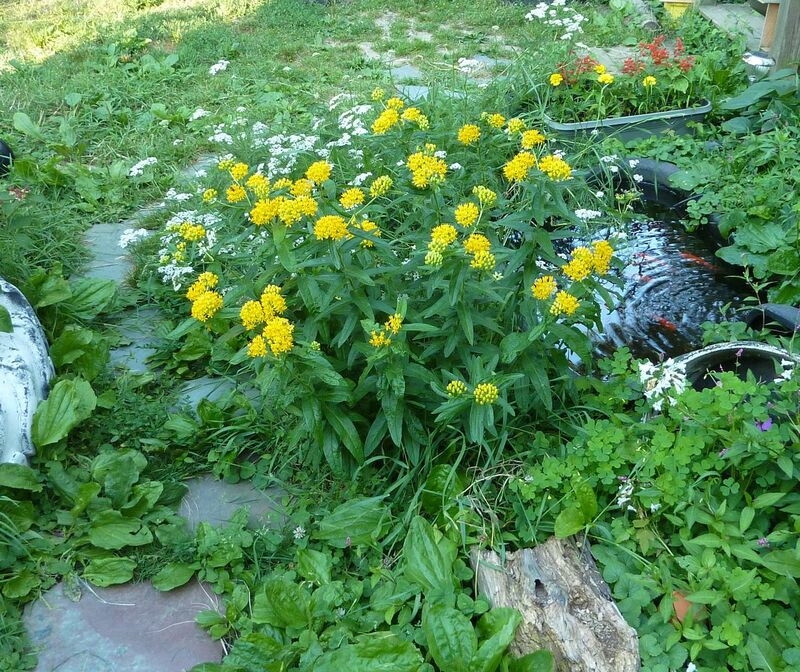 It's ball-shaped flowers capture the eye, it does well in wet areas, butterflies fight to gain access to it's nectar, and it serves as a host plant for 18 species of Lepidoptera in my neck of the woods. These include the ethereal promethea moth (Callosamia promethea), the hydrangea sphinx (Darapsa versicolor), and the saddleback caterpillar (Acharia stimulea). What better way to introduce your kids to the wonders of nature than to have them watch a female promethea moth emerge from her cocoon, inflate her wings, and attracting a male of her species within minutes for coupling? With such a riveting description I had to buy one. The only problem is the first year the plant went into shock only producing new growth from the ground and nothing from the existing wood. The second year I was happy to see all of the existing growth came back to life but still no flowers. This year though, I finally see little flower balls buds forming all over the plant. I can't wait to see this plant in action. Look At That Video! It's like every species of North American Swallowtail is on the same plant all at once. Spicebush Swallowtail (Papilio troilus), Eastern Tiger Swallowtail (Papilio glaucus), and the Zebra Swallowtail (Eurytides marcellus) all in one place. Okay so we're missing a couple. How often do you see those three together though? 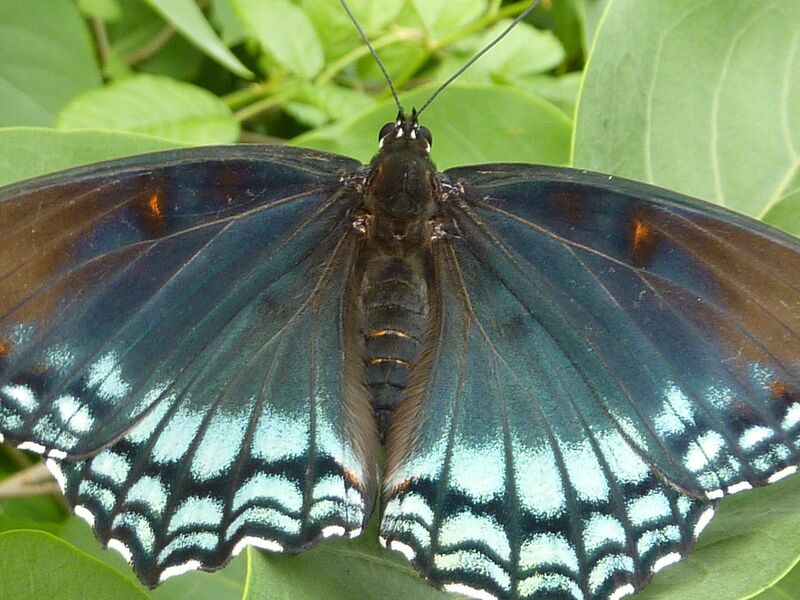 People pay good money to walk through butterfly houses at zoos. And because this is a host plant it's more beneficial to the environment than the Butterfly Bush, Buddleia sp. Probably far less dead heading involved too. I hope my plant flowers well enough that I can add to this collection of videos and show the world how wonderful this plant is truly said to be. 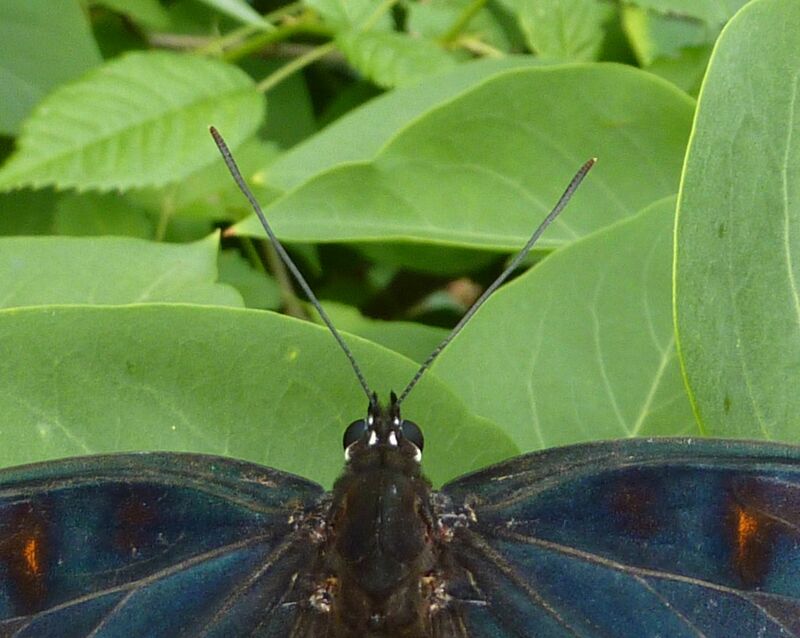 A closer look at the Red-Spotted Purple, Limenitis arthemis. This was being unusually cooperative. Normally they fly away when you get closer than 5 feet. This one though let me poke him in the head with my camera. I suspect it was freshly hatched.